How to Recover Missing Outlook Notes in Windows OS Quickly? There can be many scenarios when Microsoft Outlook PST file become corrupted or damaged. The chance of accidentally deleting Outlook PST items is very common among users. If you are searching for a reliable solution to recover missing Outlook Notes, then go through below described sections. The blog will discuss the expert solution to recover lost notes in Outlook 2016, 2013, 2010, 2007, 2003 version in Windows Operating system without any data loss or damage. The best and easy solution to recover Microsoft Outlook notes is to go for SysTools Outlook PST Recovery software. The application can recover deleted Outlook notes efficiently without any data loss. What is Microsoft Outlook Notes? The Outlook Notes is one of the most advanced featured provided in Microsoft Outlook 2016, 2013, 2010, 2007, 2003, 2000. But unfortunately, this feature isn’t talked much and is almost underutilized. Most of the Outlook user ignore notes. It is because of many of them not familiar to notes, its functions and working. The Outlook notes can remember important events and it helps in organizing the work efficiently. This blog is for the people who use notes but faces issues in its proper functioning. We discuss few solutions to recover missing Outlook notes in windows OS. Recovering deleted or lost notes in MS Outlook is not a big deal. 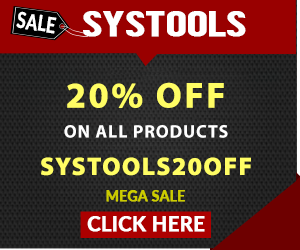 Go through the upcoming sections to know more. To know more briefly regarding notes folder missing in Outlook 2016 and other editions in real time, let us find user scenarios that people ask in Outlook related discussions. 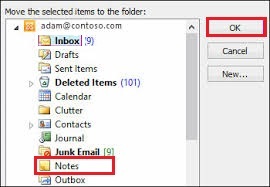 From the above scenarios, it is clear that there is an Outlook user who faces issues with accidentally deleted Notes file. Here we discuss the best solution to recover lost notes in Outlook 2016, 2013, 2010, 2007, 2003 versions without any data loss. The Outlook PST recovery software provides the option to recover permanently deleted Outlook notes from PST files. It can repair damaged Outlook data files which are highly corrupted. It can preview all the recover Outlook notes file in the preview panel. Try the demo version for clarification, but it only allows to export a limited number of files in PST, MSG, EML, HTML or Office 365. Activate full version to recover lost notes files and export them required file formats. Also Read: How to recover Outlook Items from OST file? Manual solutions never give 100% guarantee of success. The solution that we discuss can fix issues in some scenarios, but it is not sure. Follow the steps to recover missing Outlook notes using manual steps. 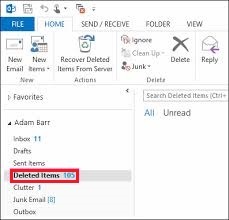 In Microsoft Outlook account, Go to Home >> Deleted Items Folder. Right click on the item that you want to recover. And press Ok.
Now choose the Notes folder, and press Ok.
Now the case is, what is deleted Items folder is cleared accidentally. In such cases, all removed items in Deleted Items Folder are moved to Recovered Items Folder for 28 days. After 28 days all removed items will get permanently deleted. Steps to recover permanently deleted Outlook Notes files. Go to Folder tab >> Click on Recover Deleted Items. Select the required item >> and click on Recover Selected Items. All the selected items will get restored into Deleted Items Folder. Move the file from it. If you could not find your files in Recoverable Items Folder, then it is impossible to recover missing Outlook notes using a manual procedure. The only solution left is to use the reliable third-party application to restore deleted notes in Outlook 2016, 2013, 2010, 2007, 2003 etc. without any data loss. The blog discusses the best solution to recover lost notes in Outlook account. Go through the manual as well as automated solution to fix this Outlook notes missing issues. Outlook notes are one of the most creative features provided in Outlook to organize and remember information. Since it is having a great advanced function, it is quite difficult to manage, if they are deleted accidentally. So, the blog describes various solutions for how to recover missing Outlook notes in windows OS.